The phrase “Bordeaux-style red blend” may be used informally to describe red wines produced from a combination of Cabernet Sauvignon, Merlot, Cabernet Franc, Petit Verdot, and to a lesser extent Carmenère and Malbec. All the red wines of Bordeaux can naturally be described as such, though it is also an appropriate term for wines made outside of the region, including those from California, Washington, Argentina and beyond. Appellation d’Origine Protegée (AOP) laws and other protections of origin mean that only wine made in the Bordeaux area can, according to strict regulations, be officially labelled as Bordeaux. The success of the Bordeaux-style red blend has seen it exported to other regions, notably the United States, though also in some of the fine wines of South America. To understand the Bordeaux style red blend better, it is worthwhile to establish some facts about each of its composite parts and what they bring to the overall blend. Cabernet Sauvignon produces deeply colored, highly structured and full-bodied wines with ample acidity. The Cabernet Sauvignon grape is naturally high in tannin and is thus capable of aging for decades, sometimes in fact requiring it to be approachable and enjoyable. 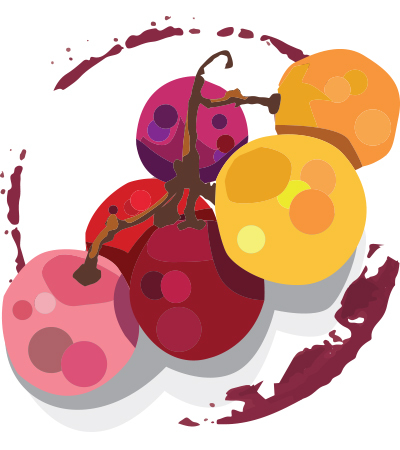 In youth, Cabernet Sauvignon shows black fruit aromas and flavors, particularly of blackcurrant, that over time give way to subtle, nuanced tertiary aromas. Merlot is a softer and rounder grape variety, with more obvious fruit than the Cabernet Sauvignon. Though capable of producing superb wines by itself, its job as a counterbalance to the austerity and astringency of the Cabernet Sauvignon should not be overlooked. The grape is widely grown and produces wines from entry-level to some of the world’s finest, with Pomerol’s Pétrus and Château Le Pin the standard-bearers. Cabernet Franc is a parent of Cabernet Sauvignon, though is considerably lighter in color, body and tannin. It offers a Bordeaux-style red blend more obvious fruit than Cabernet Sauvignon, as well as a pleasant herbaceous note. Its lighter body can be welcome when blended with its more robust progeny, offering crispness to the wines. Petit Verdot remains a small but important part of many quality Bordeaux-style red blends. Single varietal wines are powerful, deeply colored and tannic. In blends, it boosts tannins and deepens the color, and offers a distinctive spicy note. Malbec also plays a smaller supportive roll in Bordeaux and is more common in nearby Cahors and, notably, Argentina. At its best, it is deep-colored and fruit forward. Carmenère is nearly extinct in Bordeaux today and is much more significant in Chile. It is a low-yielding grape that produces deep-colored, full-bodied wines. Browse an extensive collection of wine Buying Guides using our online database below. We’ll help you to locate the next Bordeaux-style blend to suit your palate and occasion.